According to a recent market research report released by Transparency Market Research, the commercial refrigeration equipment market in Europe is expected to grow at a CAGR of 4.2% during the period between 2013 and 2019. 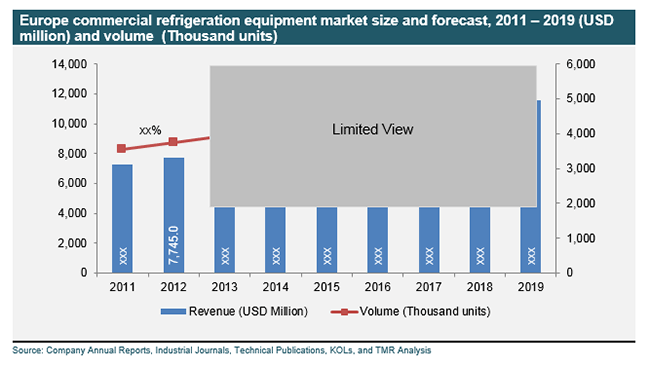 The report, titled “Commercial Refrigeration Equipment Market - Europe Industry Analysis, Size, Share, Growth, Trends, and Forecast, 2013 - 2019”, forecasts the Europe commercial refrigeration equipment market to be worth US$11,597.2 million by 2019. The overall market was valued at US$7,745.0 million in 2012. The report points out the rise in international food trade, horticulture, and seafood and processed food exports as the primary reason behind the growth of the commercial refrigeration equipment market in Europe. Changing food consumption trends, aided by the emergence of supermarkets, hotels, and cafes, have further augmented the growth of the market in the region. Advancement in product technology is also expected to boost the market. However, the report mentions that the implementation of environmental regulations will restrain the growth of the overall market. The report states that environmental regulations have led to the development of solar-powered commercial refrigeration systems. Introduction of remote-monitored commercial refrigeration equipment will open new opportunities for the market in the near future. Remote-monitored commercial equipment offers benefits such as the ability to monitor the system to detect refrigerant leak, high system pressure, and high liquid levels. Allowable refrigerant charge for different locations or applications has emerged as the latest trend in the commercial refrigeration equipment market in the region. On the basis of product type, the Europe commercial refrigeration equipment market has been segmented into beverage refrigeration equipment, refrigerants and freezers, transportation refrigeration equipment, and other equipment and parts. The refrigerants and freezers and transportation refrigeration segments are growing rapidly and together accounted for a 36.2% share in market revenue in 2012. In terms of application, the report segments the commercial refrigeration equipment market in Europe into food and beverage retail, food and beverage production, food service, food and beverage distribution, and others. Food and beverage retail is expected to witness the highest demand during the forecast horizon. The report studies the commercial refrigeration equipment market across key regions in Europe such as Italy, France, Germany, the U.K., Scandinavia, and Rest of Europe. Owing to the presence of rapidly growing retail chains, Germany is forecast to remain as the largest market for commercial refrigeration equipment. The report profiles the key players in the Europe commercial refrigeration equipment market such as Dover Corporation, Hussmann International Inc., Epta S.p.A., Illinois Tool Works Inc., Metalfrio Solutions SA, United Technologies Corporation, and Hubbard Products Ltd. The report offers detailed information about the key players, such as financial overview, recent developments, and business strategies.